Morocco is one of the top destinations in the world. This beautiful North African country lies on the border of Europe and the rest of the Arab world, drawing people in with its colourful souks, vibrant landscapes, cheerful hospitality and, most importantly, the food. 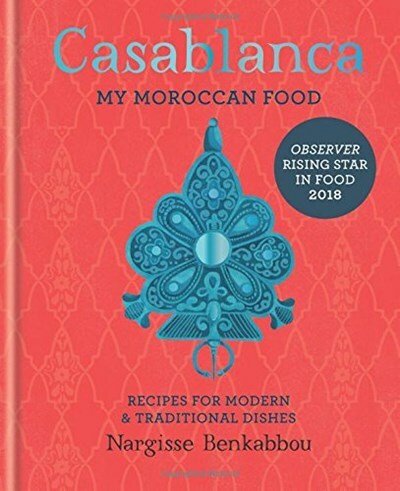 Casablanca is the exciting debut from Moroccan chef Nargisse Benkabbou. This book features recipes for simple and satisfying dishes such as Artichoke, baby potato & preserved lemon tagine, Sticky ras el hanout & peach short ribs and Buttermilk chicken kebabs. Also featured are tasty western classics with a unique Moroccan twist: try your hand at Orange blossom, beetroot & goats' cheese galette, Roasted almond & rainbow couscous stuffed poussin and Moroccan mint tea infused chocolate pots. Nargisse breathes new life into Moroccan cuisine, blending that authentic Moroccan spirit and the contemporary to create accessible recipes for the everyday.